Ah, the holiday season! Carols, bells, mistletoe and so on and so forth. And, for most of us, entertainment traditions that can go back as far as we remember. Whether it's watching A Charlie Brown Christmas and Rudolph every single year, or awaiting that Christmas Day broadcast of The Sound of Music, people connect memories of the winter holidays to favorite stories—for any number of reasons. This year, City Weekly contributors share the movie-(or TV-)watching that, for them, has become unexpected "it's just not Christmas without [fill-in-the-blank]" holiday comfort food, beyond obvious favorites like It's a Wonderful Life. So settle in with a cup of eggnog, and share with us what stories make your season shiny and bright. 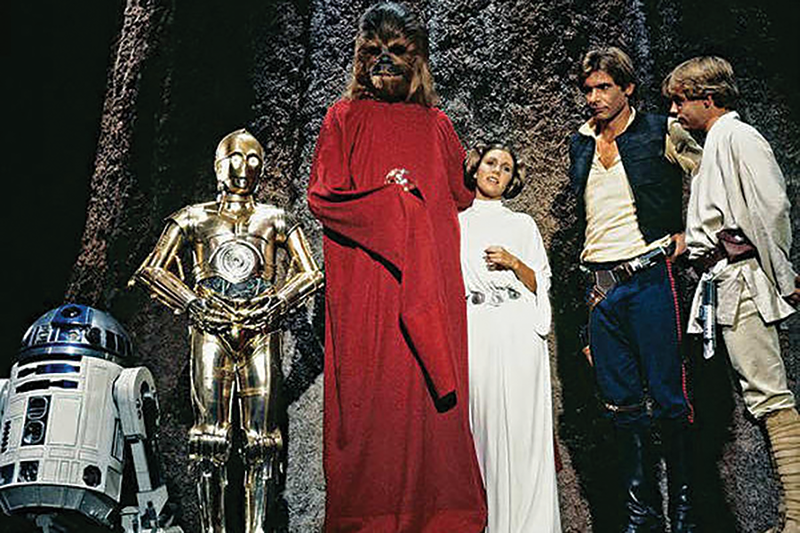 MaryAnn Johanson: I was 9 years old at Christmas 1978, and it is beyond impossible that I did not watch The Star Wars Holiday Special when CBS broadcast it thatseason. I was a complete Star Wars nut; The Force was strong with me. Of course I watched it. And yet, I have absolutely no memory of it from that time. Watchingit again as an adult, it is plain why: It is so incredibly awful that obviously my grade-school brain, in an attempt to protect my fragile innocence as wellas my burgeoning geekdom, blocked it, lest I re-experience the trauma. Even today, and far more cynical in my fandom, my mind never fails to boggleat its 1970s variety-show kitsch done up Star Wars-style. The "guest stars" of this one-off include Bea Arthur, Art Carney, Diahann Carroll, HarveyKorman and the Jefferson Starship (oh yes, this is a musical). It's all such an absurdly, perfectly twisted parody of 70s pop culture that if it did notexist, someone would have had to invent it. As a joke. Instead, it exists, lurking in the bootleg corners of fandom, as a real thing that was once honestlyand sincerely offered. It is a genuine Christmas miracle. Scott Renshaw: The 1947 version of Miracle on 34th Street is justifiably revered as a holiday classic, with Edmund Gwenn as the department-store Santa named Kris Kringle convinced he's the real Saint Nick; my wife refuses to make it through a December without experiencing the charming moment when Kris speaks to a little girl in her native Dutch. Yet, I've become inexplicably attached to the 1994 incarnation of Miracle on 34th Street, with Richard Attenborough as Kris and Mara Wilson taking on the Natalie Wood role of a cynical youngster getting a glimpse of Christmas magic. Much of that has to do with Wilson, who—between this movie and Danny DeVito's Matilda—was one of the most naturally adorable child actors of my lifetime. I can't even point to a specific moment like that little-Dutch-girl encounter that gives me the Yuletide feel-goods. There's just something about Wilson's smile that captures everything good and true about a time that can be so full of stress and anxiety. David Riedel: Look, I digA Christmas Storyas much as the next guy born and raised in Indiana. But aside from maybe catchingThe Bishop's Wife, I'm burned out on Christmas flicks. This year, I'd much rather watch something silly and easily digestible, the holiday-viewing version of comfort food. So that's why I'm super psyched that I just purchased the entire 10-season box set of the original Beverly Hills 90210 on eBay. That's right: The paragon of cheesy '90s teen/early 20s dramas contains nine Christmas-themed episodes (the bastards didn't make one the first season). Will I start with "It's a Totally Happening Life," the third season tale in which Brandon (Jason Priestley) and the gang are nearly killed in a bus crash, but are ultimately saved by a couple assbag guardian angelsIt's a Wonderful Life-style? Or maybe "Walsh Family Christmas" from season two, in which Steve (Ian Ziering) journeys to New Mexico to find his birth mother? Or maybe season eight's "Santa Knows," featuring future two-time Oscar winner Hilary Swank! Or the season six episode when Clare (Kathleen Robertson) tells Steve she's wearing mistletoe on her garter. MY GOD, THERE ARE TOO MANY TO CHOOSE FROM. Guess I'll have to watch them all! Eric D. Snider: I had no particular Christmas movie traditions until the mid-2000s, when Will Ferrell's Elf got stuffed down my chimney. Other perennial favorites (A Christmas Story, It's a Wonderful Life, yada yada) had their charms, but watching them always felt like watching a religious pageant: more ceremonial than entertaining. Elf—the story of a human baby named Buddy raised by Santa's elves who goes to New York City in search of his father—is drop-dead funny and unabashedly wholesome (the worst thing an elf can call someone is "cotton-headed ninny-muggins"), with a gentle message about What's Really Important. The supporting performances are great—Ed Asner as Santa, James Caan as Buddy's real father, Bob Newhart as his adoptive elf dad, Zooey Deschanel as the department store employee he falls in love with—but it's Ferrell's completely committed performance that sells it. Buddy's bottomless optimism, enthusiasm and naïveté would become cloying if Ferrell ever winked at the audience, ever showed a glimmer of "This is kinda silly, isn't it?" But he doesn't. Buddy believes he's an elf—and more importantly, Ferrell believes that Buddy believes it. Sincerity goes a long way, especially at Christmastime.